Open House! 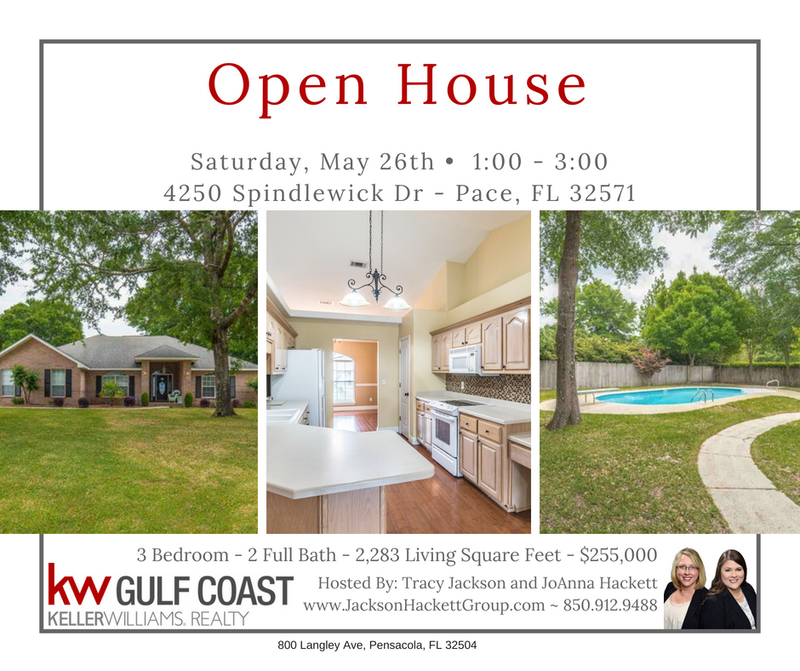 Saturday May 26th from 1:00-3:00 at 4250 Spindlewick Dr in Pace, FL. Welcome Home! This all brick home is located in the elite subdivision of Hammersmith. Inside you will fine 3 bedrooms and 2 full baths with over 2,200 square feet of living space. The inviting front porch leads you in through the leaded glass entry door that is set off with side lights and transom. You will find that this house boasts high ceilings throughout. The floorplan is modern with an open concept. Plant shelves are featured, as well as, crown molding. There is gorgeous hardwood flooring in the living area, dining areas, and kitchen. All the rooms are spacious throughout this home. The spacious kitchen has solid surface counter tops and all appliances will remain. A built-in desk workstation is incorporated into the kitchen design as well as a breakfast bar. Enjoy your meals in the breakfast nook that is nestled in a bay window. A formal dining room is located at the front of the home and is the perfect size for entertaining. Outside, there is a privacy fenced backyard with sprinkler system plus a screened-in porch for your enjoyment. The two-car garage is side-entry for added curb appeal. This is the deal that you have been waiting for! Be sure to come see it for yourself before its gone! Listing courtesy of Jeff Folds with Keller Williams Realty Gulf Coast.